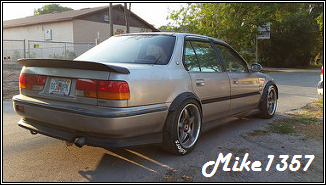 Hey Mike, what brand of spacers are you using? I am looking for some 3mm spacer to clear my calibers in the front. Technically, I was looking for them too, and couldn't find them, but a friend hooked me up with them. Gimme your email and I can email them to you to print out. That would be amazing man! I used that brown kitted pixel car base in your sig to see what I could do with it. I hope you don't mind. I put my version in my sig if you want to check it out/give me some pointers. have you started prep work on the reverse head yet? haven't got the mula yet???? alright thats all iwanted to kno..your money will be sent out tom.